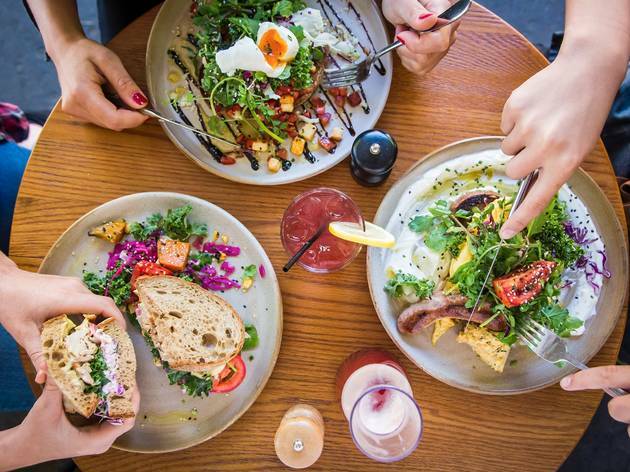 Sydney's love for a breakfast knows no bounds – we will queue for ages, seek out the most Instagrammable dish and champion our favourite brunch for days. 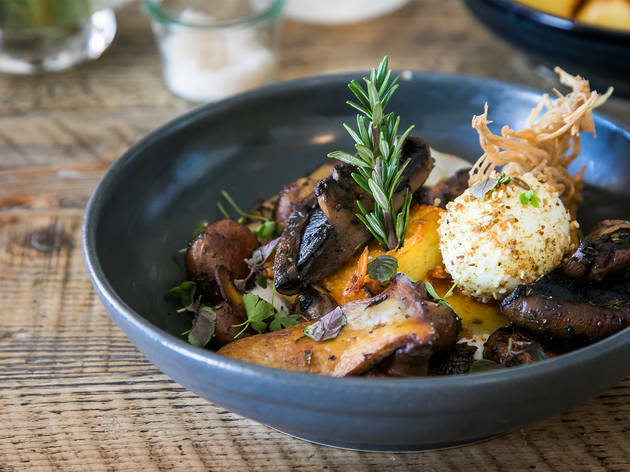 There's plenty to choose from, but these cafés are a cut above the rest – think eggs everywhere, coffee like liquid gold, menus that branch out beyond bacon, seaside locations and service that'll have you all to happy to have left your bed. 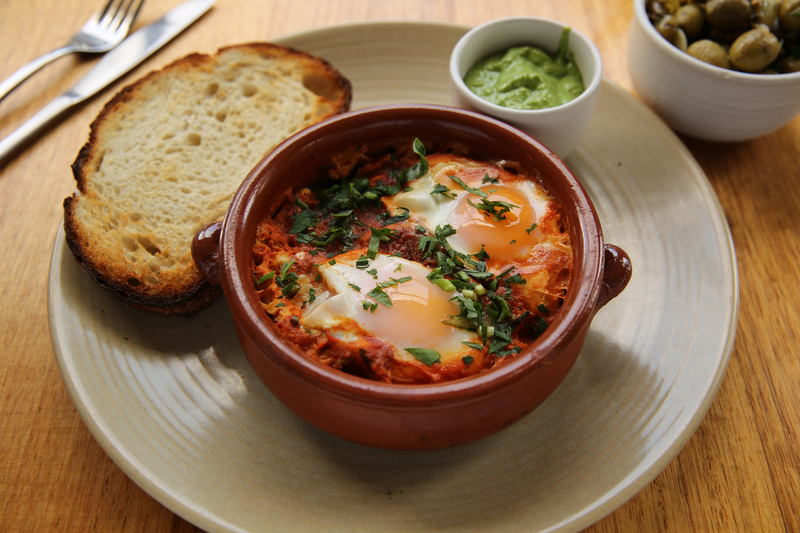 Here's Time Out's guide to the best breakfasts in Sydney. 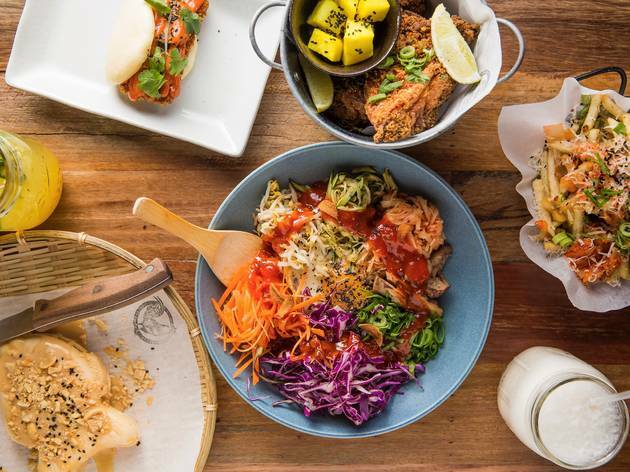 RECOMMENDED: The 50 best cheap eats in Sydney. After great a great breakfast in a specific 'hood? 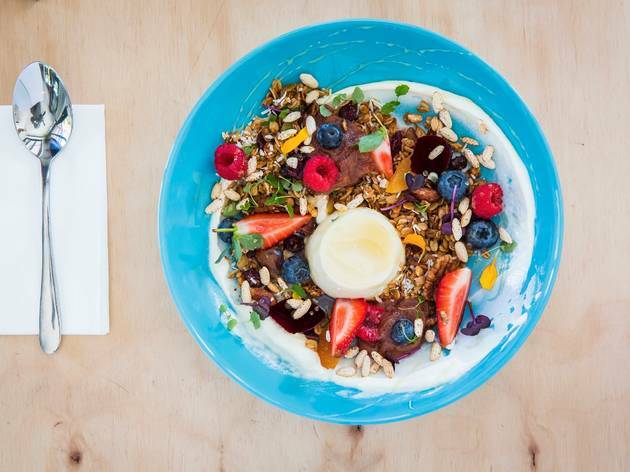 Check out our guides to the best cafés in Bondi, Surry Hills and the CBD. If you’ve never tried the liquorice bread at Yellow, you’re missing one of the best darn cakes in town. It’s a big wodge of warm, fudgy, black-as-night cake imbued with the flavours of melted down liquorice and liquorice root infusion. 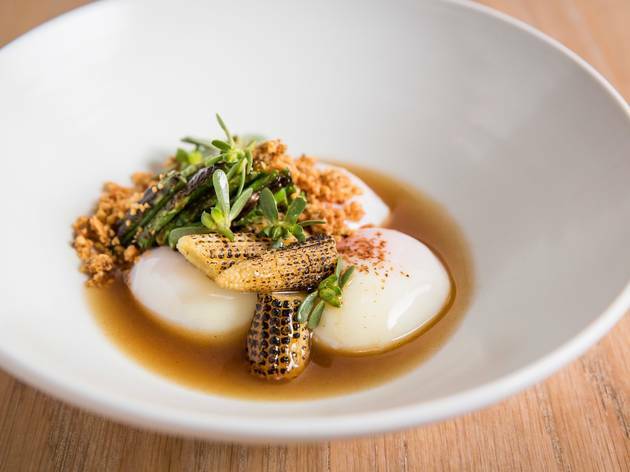 Also try the 63-degree eggs (which are like poached eggs but a thousand times more delicious – think just-set whites and loose, creamy yolk spilling onto the plate) with a thick ham hock consommé, cheesy crumbs, charred corn and lengths of snake beans for crunch. 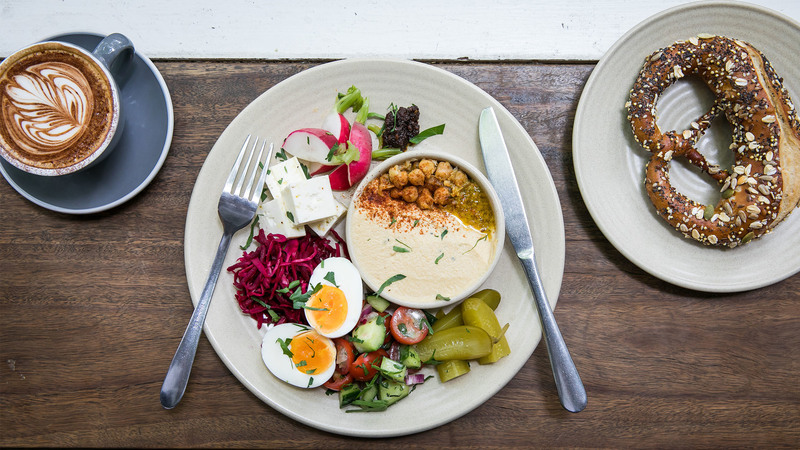 This is a satisfying Middle Eastern plate of sour, salty and spicy things comes with a warm bagel or pretzel from South Dowling Street’s Organic Bread Bar. 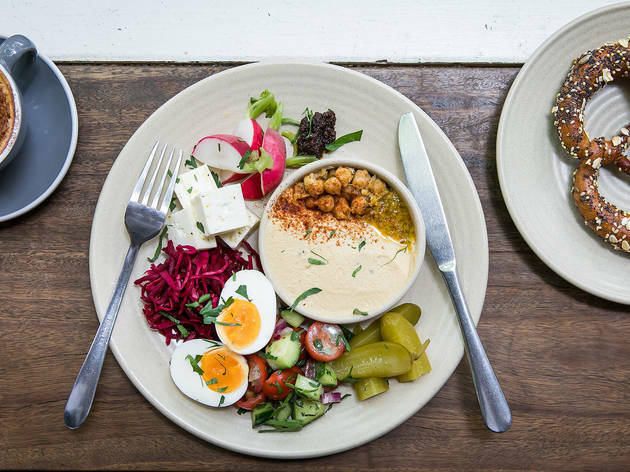 Dip the bread in the small bowl of hummus and chickpeas and dig into three cubes of feta, a half boiled egg, pickles, radish, cucumber, baby tomatoes, pickled red cabbage and pilpelchuma – like Libyan Jewish sambal. Do you prefer your morning meal to be as precise and segmented as an edible Duplo set? The Scando breakfast is for you. 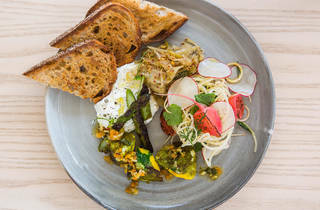 A tray with a big wedge of the gentle, creamy and slightly nutty Maffra cloth-bound cheddar, half a pear and a little pot of sweet apple and quince jam is joined by two finger-scalding boiled eggs, two thin slices of a dense rye bread peppered with sunflower seeds, and a pat of Pepe Saya cultured butter. You can approach it like a cheese board; make eggs and soldiers the priority; or treat it like a three-course toast tasting platter – there’s no wrong way to graze. This totally boss spot for a haloumi and egg roll understands the importance of multiple condiments. Not only do you get a herby aioli with your fried egg and cheese, but also a sweet swipe of tomato relish to brighten the wilted greens. Want something a bit more adventurous than a brekky roll? You’re in luck, because these guys are taking the café menu to great new heights with a wobbly yoghurt panna cotta surrounded by a sea of berries – breakfast for dessert is the way to go. This little café up the north end is very popular, but also very good at dealing with the queues outside on weekends. 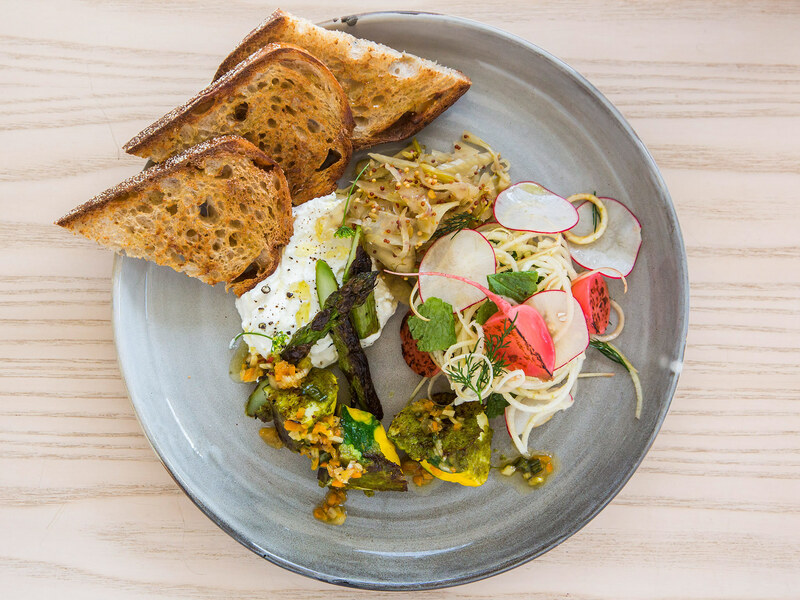 While Will Smith loves the green pea pancakes, we say you should order the Woodsman. 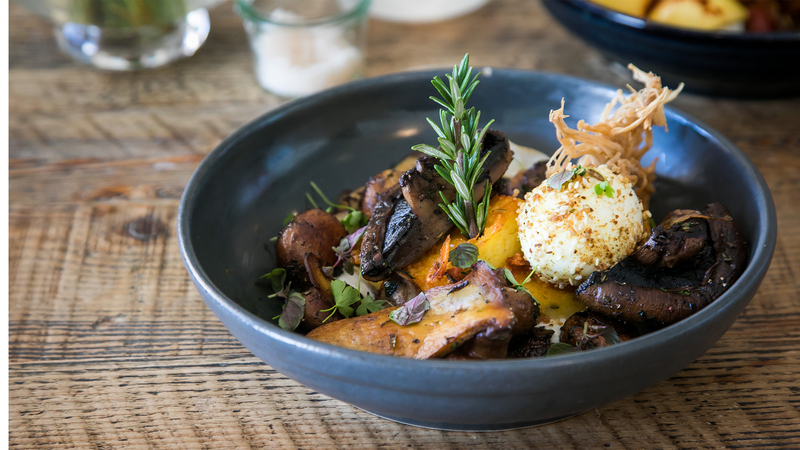 There is no room for sides when you’re facing down a dish of two golden squares of polenta cake, pan-fried mixed mushrooms, a swipe of goat’s curd and a soft boiled egg rolled in dukkah. Feeling dusty? Add a Bloody Mary. It’s basically a meal in itself, with cucumber, celery, pickles, tomatoes and lemon as a garnish. 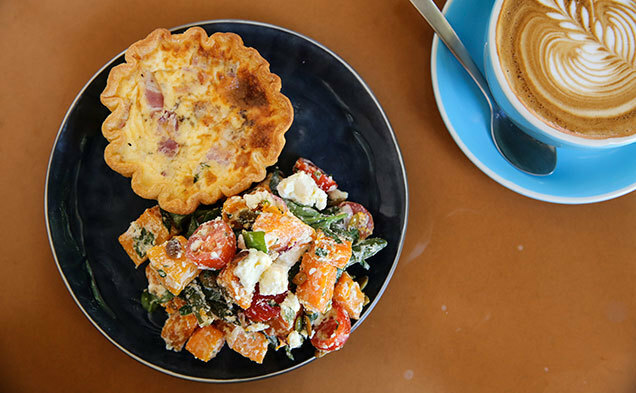 Open for brekky, lunch and dinner, Rising Sun Workshop – half motorcycle workshop and half café – is serving breakfast food with a Japanese bent. The breakfast ramen, in particular, is such a good idea that our heads hurt a little from the excitement. It’s a beautiful big bowl of rich, fatty broth made from an infusion of buttered toast, topped with stretchy, firm noodles made exclusively for Rising Sun Workshop to their own recipe. 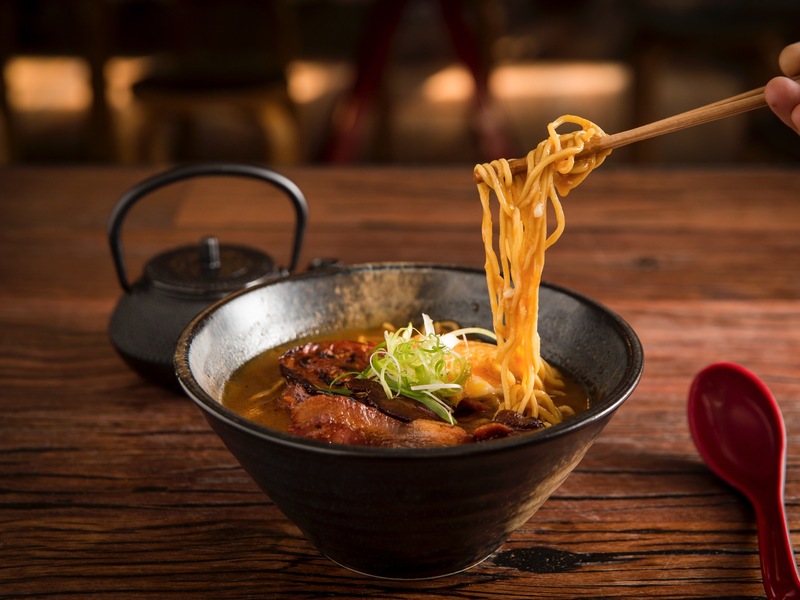 The whole lot is topped with a just-set onsen egg, shards of crisp bacon and a charred tomato – the savoury, umami depth of which is a strike of pure genius. 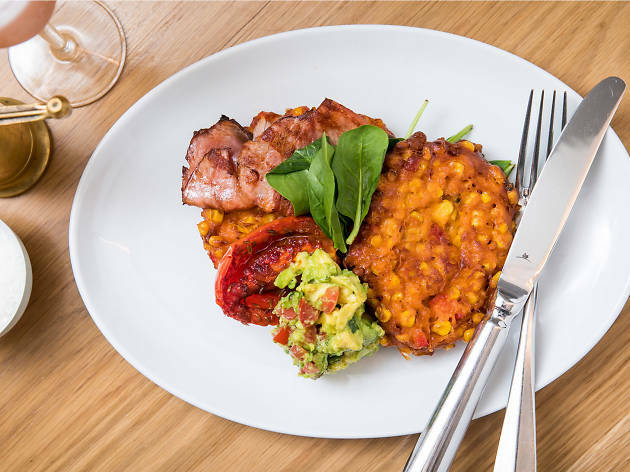 This bad boys are a classic for a reason – all these years on (with additional cafés in Surry Hills and Bondi too) Bills still do the best corn fritters in the city. 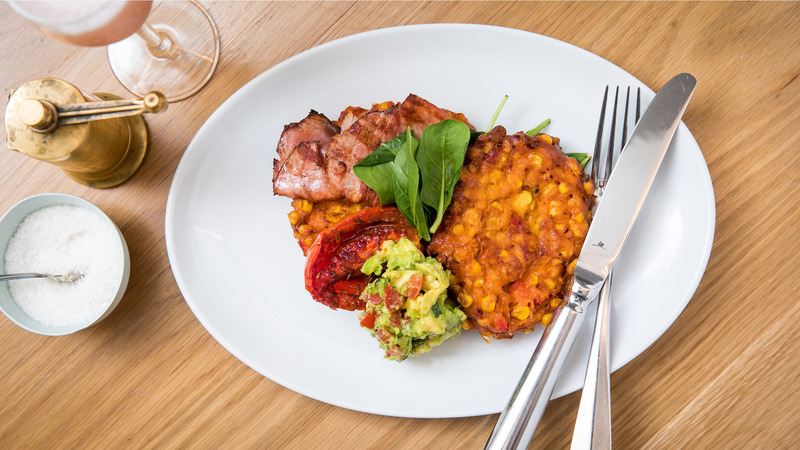 It’s worth adding the avo salsa ($4) too for a fresh step amongst the bacon and tomato. Now is not the time to budget, it’s the time to order another Bloody Mary that they make with Clamato, lime and coriander, or maybe a sweet white peach Bellini. 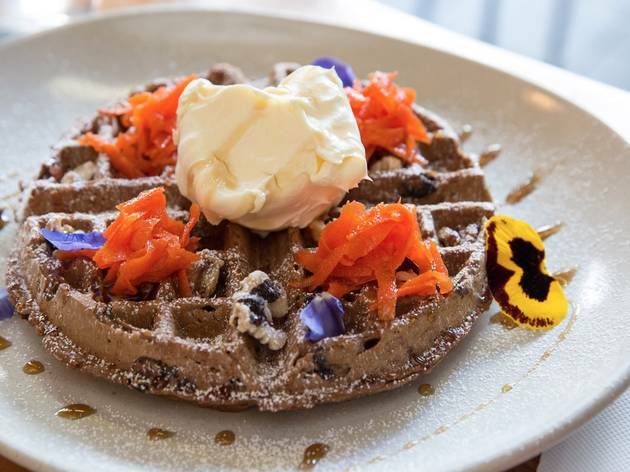 If you want to drink with brunch, Bills is the place to do it. You know those That’s Not My... baby books full of different textures? The corn pudding is the breakfast edition. 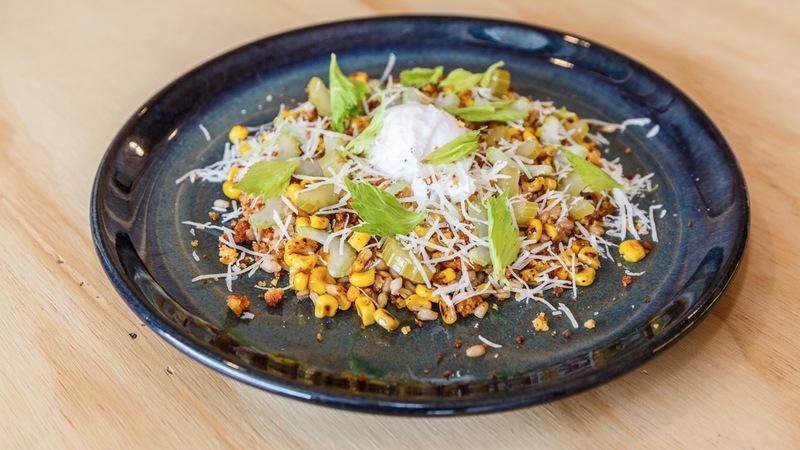 You've got a soft and creamy poached egg as the prize in the centre of a ring of chewy spelt grains; charred corn kernels; a sweet creamy corn puree base; and bits of corn bread. A smattering of parmesan adds savoury grunt and the combination of fresh and picked celery slices adds fresh zip and vigour. We’ll be coming back for the breakfast rice with chorizo and bacon with a nectarine soda on the side. 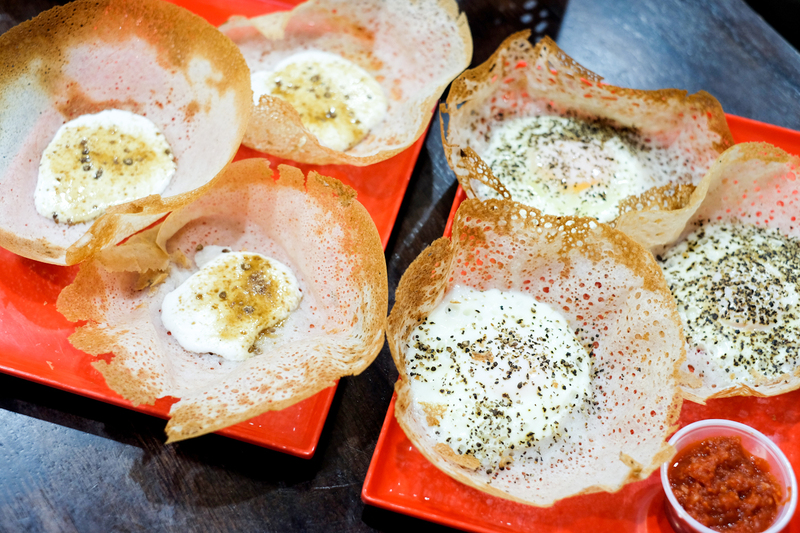 It’s worth upgrading to the egg hopper ($9 for three), boosted with a gooey yolked egg in the middle. 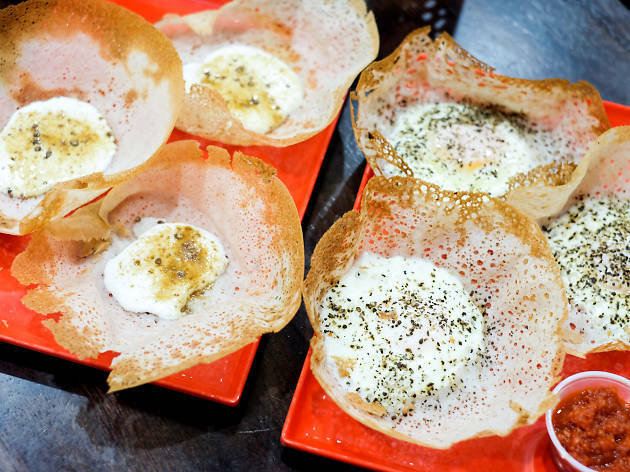 Your egg hoppers will arrive with cracked black pepper across the top and a dish of lunu miri chilli sambol on the side. Sure you could use the cutlery provided but it’s much more satisfying to make like a local and eat with your hands. Tear off bite-sized pieces and dip them into the runny yolk. The faint tang you can detect is from the batter, which is made from fermented rice flour and coconut milk. 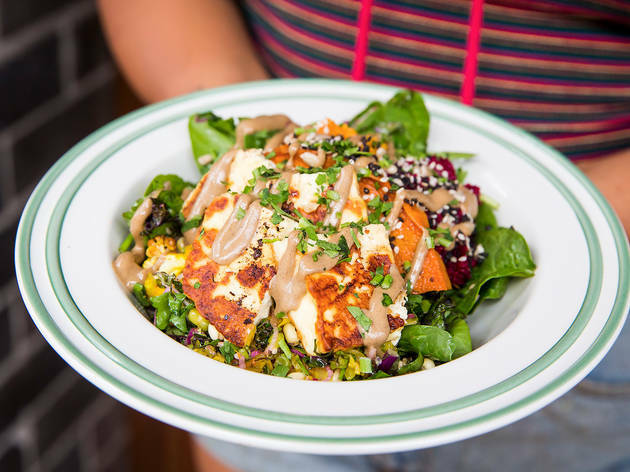 This plate is so pretty it deserves a Hollywood screen test (the ribbons of carrot and edible flowers are especially good looking), and is also safe for coeliacs and even vegans (if requested without the mascarpone on top). 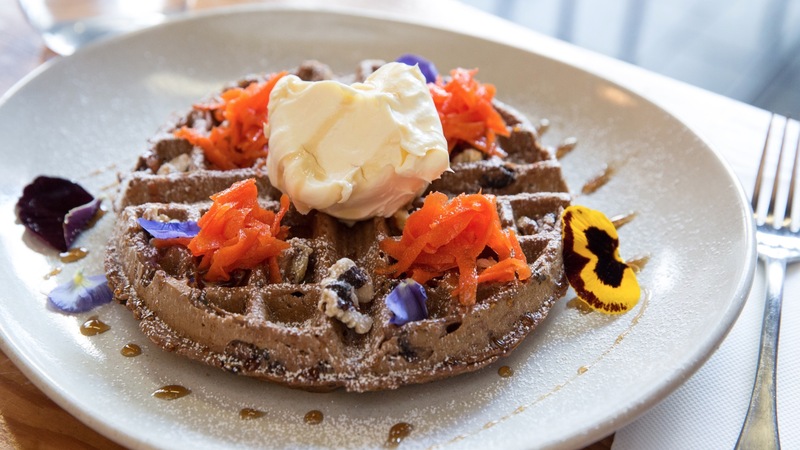 Made with coconut milk, grated carrot, mixed nuts and some sprinklings from the spice rack (cinnamon, nutmeg and all-spice), the waffle tastes like gingerbread hitting on carrot cake. 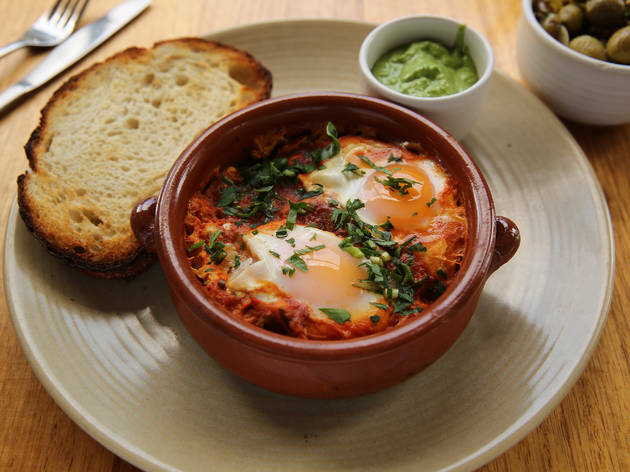 Kepos knows full well that Sydney is a breakfast town and have ensured their soft-baked eggs and tomato shakshuka appears on both the breakfast and lunch menu. Two eggs with just-set whites and runny centres come girt by a sea of spiced tomato sauce – you’ll need a second slice of toast to mop up the rich, yolky remainder as well as the side of tahini mixed through with fresh coriander. 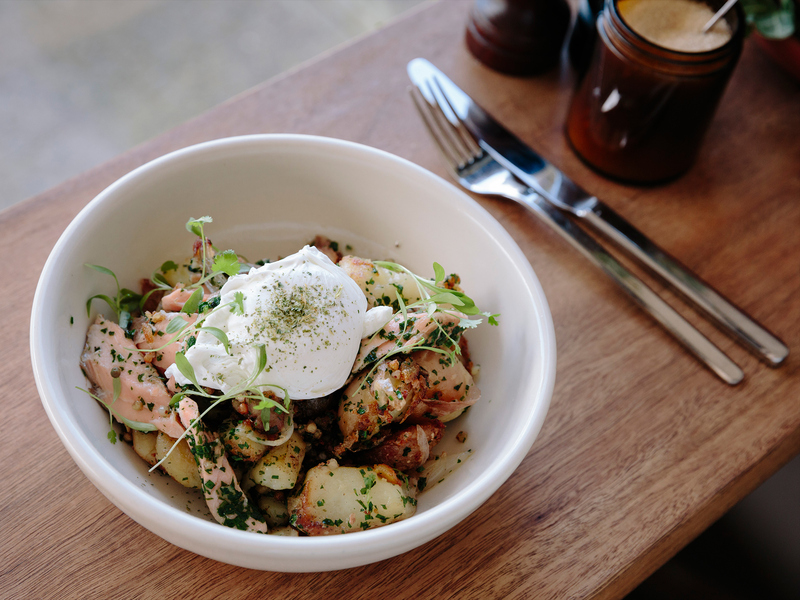 It's been nearly four years since we stumbled upon this café in the quiet suburban streets of Ashfield and ordered the pork hash breakfast. That dish was a revelation. Tender strands of pork hock with crisp, caramelised edges tossed with sweet, roasted eschallots, golden potato nuggets, chives and micro herbs. 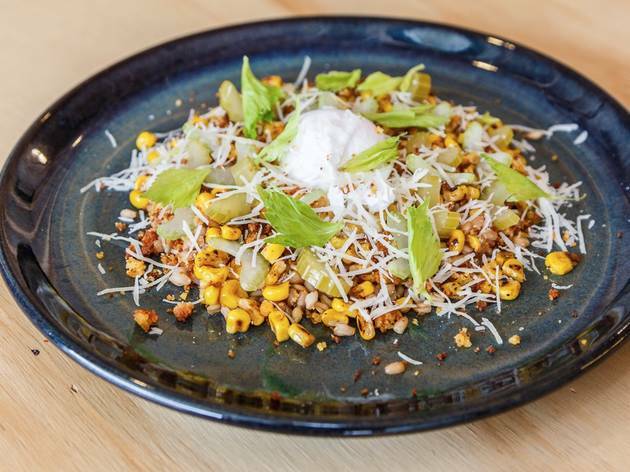 This crisp, crunchy mess wore a wobbly poached egg like a jaunty cap, but the truly genius addition was the crunchy little buckwheat kernels. It was the most exciting thing to happen to café breakfasts that year and still is just as good. Here, a thick-cut slice of Bread and Butter Project rye batard comes slathered in celeriac puree, which adds a creaminess where non-vegans would usually miss butter. Swiss brown mushrooms are cooked so they are still juicy but not soggy, while whole cloves of roast garlic add richness. 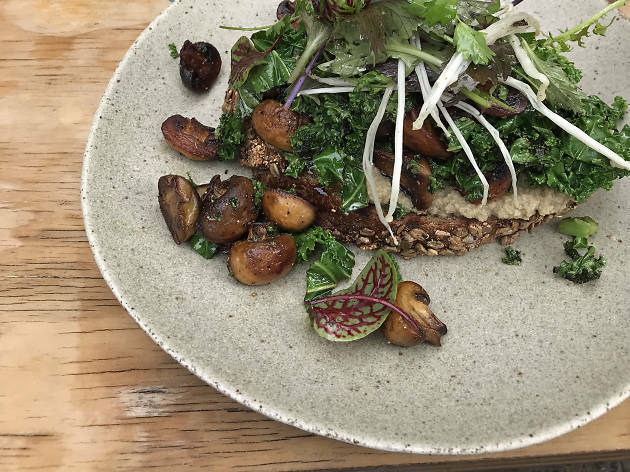 A double green smash of charred kale and dressed salad leaves on top adds freshness, and there’s a scattering of enoki mushrooms for texture too. It’s an awesome plant-based breakfast that showcases why they say mushrooms are the meat of the veggo world – hearty, flavoursome and filling. If you just want a simple, hand-held brekky it doesn’t get much better than a bacon and egg roll, and they make a very good one at the Shop, a little café and wine bar on Curlewis Street that’s the size of a walk-in-wardrobe. 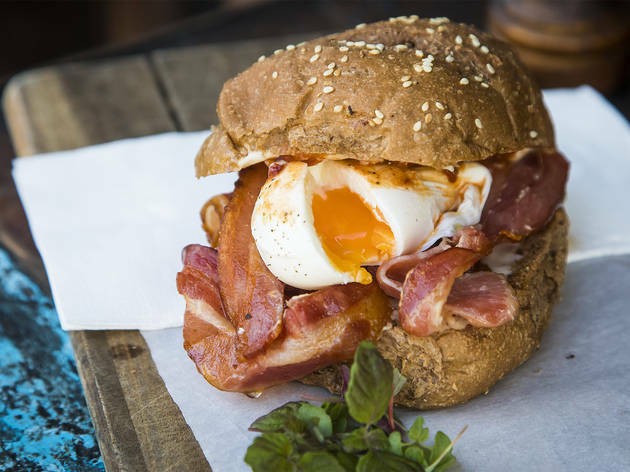 The kitchen is tiny, but they’ve got their systems sorted so that by the time your coffee is ready they’ve warmed up a soft, fresh brown roll, slapped aioli on both sides, daubed it with tomato relish, crossed it with two bacon rashes and capped it off with a fresh poached egg. You’ll see it stationed on every other table, and all over Instagram. 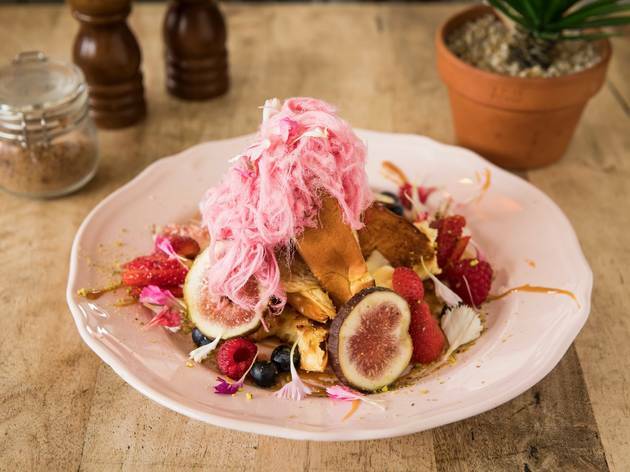 And there are good reasons why the brioche piled with fruit, flowers and hot-pink fairy floss is the pin-up-pretty number that everyone wants to order at this Petersham café. Yes, it’s designed to rack up double taps and approving emojis, but this dish is actually delicious. Served like French toast, the brioche slices are dusted with crumbled pistachio and partly sealed with mascarpone. A ring of mixed berries, Canadian maple syrup and salted caramel surrounds the toast like a security detail. And the crown of Persian fairy floss tastes like pure rosewater, not the oversugared frizz you’ll find at carnivals. For a dessert with an OTT presence online, it’s a surprisingly balanced mix of sweetness, nuttiness and well toasted carbs. 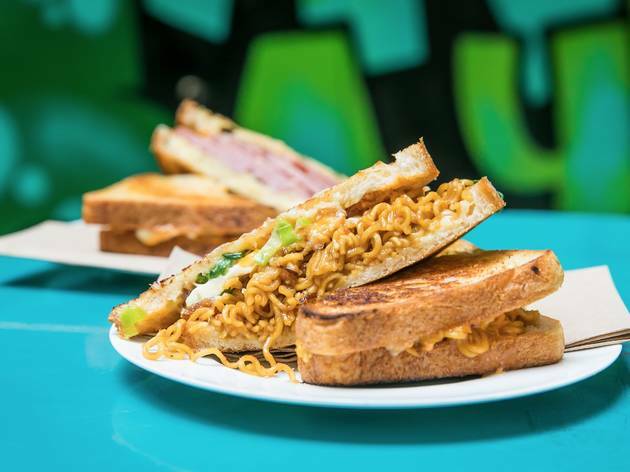 They’re constantly transforming well-grilled slices of Infinity Bakery’s traditional tin loaf into killer toasties that demonstrate the stretching powers of good cheese. 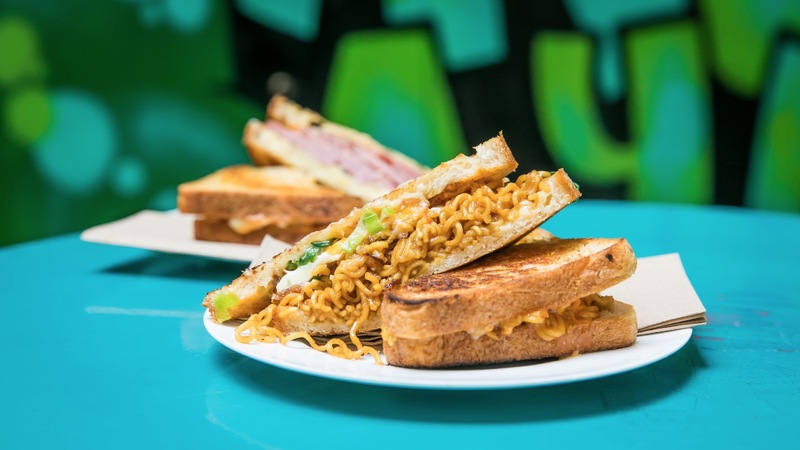 The best is the Mi Goreng, which is a genius collision of two great late-night snacks. Dutch Smuggler’s version squeezes in noodles, a fried egg, shallots, a double meltdown of cheese (oozy mozzarella and sweet, nutty Gruyere) and a mysterious “magic sauce” between its crunchy triangles of bread. 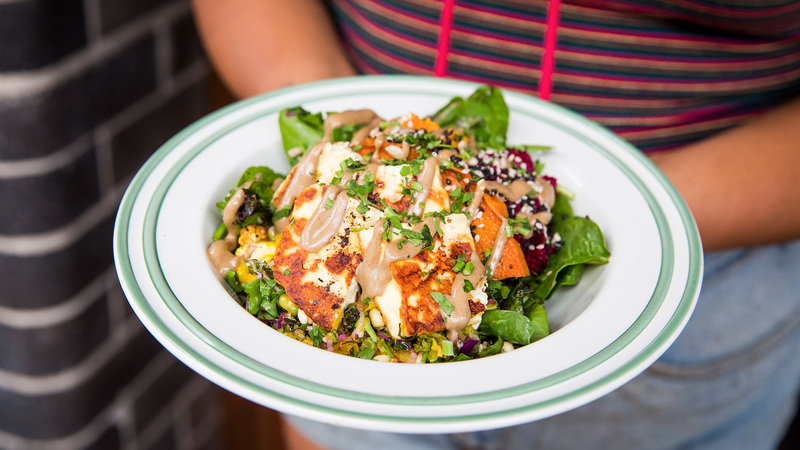 Originally a special, it’s no wonder it now has permanent residency on the menu – it deserves it. These guys understand that you can mess with the classics, but not too much – there are certain expectations when it comes to a café breakfast. Of course, you want silky scrambled eggs on sourdough, but here they are topping it with silky strips of lemon myrtle-cured salmon. The side salad of baby spinach, kale, cress, fennel and fermented cabbage sits like a healthy shrub on top of a sour swipe of natural yoghurt. In one dish you get the things you want as well as the things you need. Smart. Let's sashay to France for a minute, and talk about the "Mr Croque" cheese toastie. I once heard a guy say the best thing France ever gave us was the Croque Monsieur. He had a point. 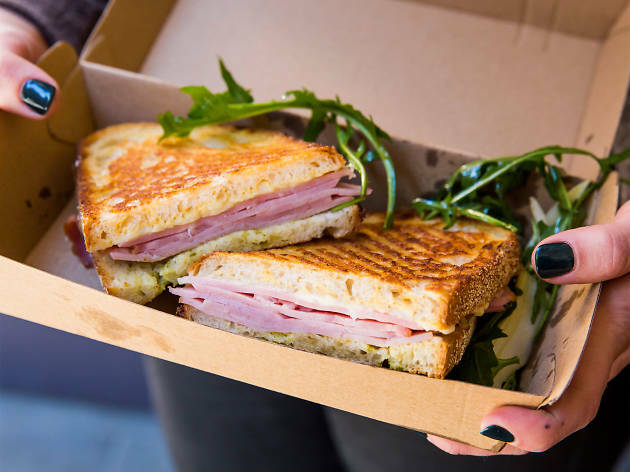 The basic premise “à la française” is a sandwich filled with ham, cheese, and then drizzled in béchamel sauce before being grilled to perfection. Here the bouncy, chewy sourdough comes from the Bread and Butter Project, and it’s filled to the breaking-brim with generous swathes of tender leg ham, a lick of Dijon mustard and a thick layer of cheddar cheese-enriched béchamel. Then it’s fried. In butter. 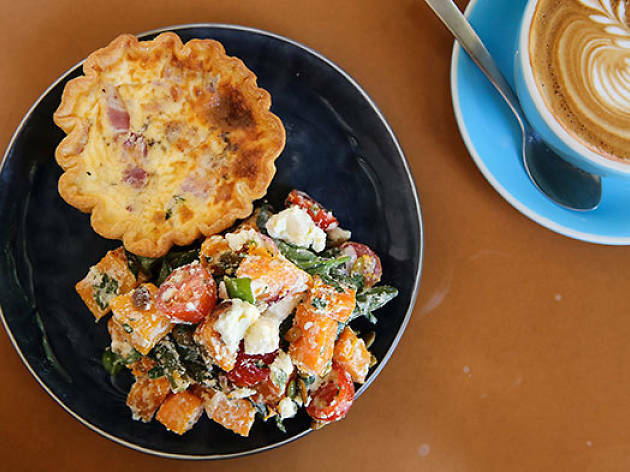 On the side: a tart salad of pickled vegetables and rocket to cut through the richness. 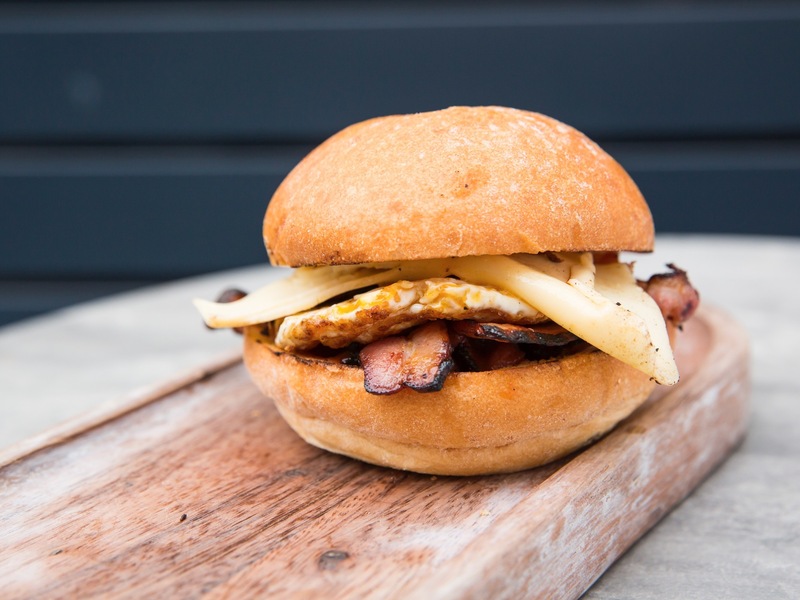 It's a bloody glorious thing – one of the best sandwiches in the CBD, hands down. Order it. This is a handheld brekky at its finest. The thin pastry shell has just enough gumption to hold in a king's ransom of golden fluffy egg filling punctured with molten deposits of tangy goat's cheese and soft, sauteed leeks running through the lot. It's a thing of beauty, as is their Lorraine if you're traditional about quiche. You get two eggs fried in ghee alongside a pile of greens sautéed with mushrooms and topped with turmeric-rich, gingery chilli sauce, some mashed-up avo, and pink, nicely sour sauerkraut. You also get sai bread; the dense, seedy, totally delicious bread they make in-house (which they now sell by the loaf to take away). Not that hungry? Try a snack of the same bread topped with soft Central Coast cheddar, sauerkraut and olive oil. After a handheld hangover buster? Whoever first put cured, fried pork and soft, melty eggs together deserves a seriously prestigious award, in our opinion. Stuff them between two layers of soft white bread, spread on a heap of butter and you’ve pretty much got food nirvana right there. 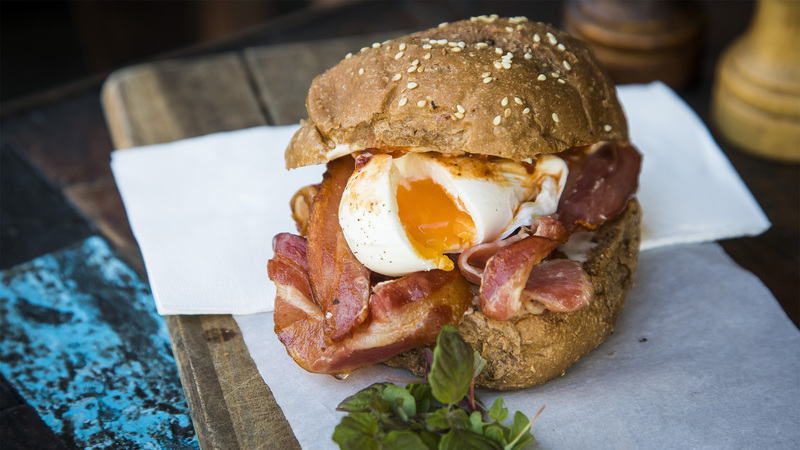 So we took it upon ourselves to traipse the streets of Sydney to find you the best bacon and egg rolls to fix any hangover, heartbreak or hard-earned snack. Man, it’s a tough job. There's a host of restaurants around Sydney serving up tasty food at prices that won't leave your wallet empty.